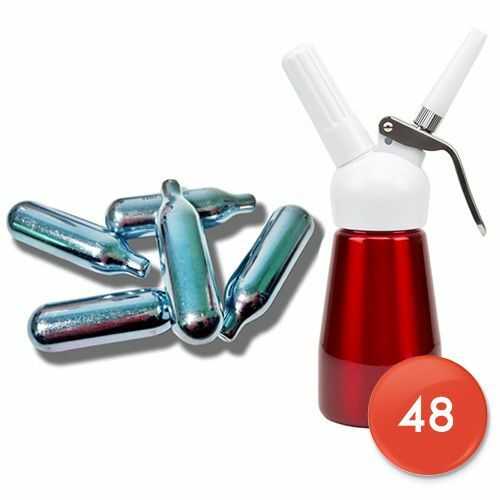 Cheap Whipped Cream Dispenser - 50 Nitrous Oxide Chargers plus whipper. The starter packs contain a whipped cream dispenser and the nitrous oxide refill chargers to go with it. The benefit of buying both together is that you can save on postage also if the items are for a gift you’ll know that the recipient will get everything they need to start making luscious whipped cream as soon as their package arrives. As with all items for sale at creamchargers.org.uk you can benefit from our guaranteed next-working-day delivery service. There are also Saturday delivery options if that is more convenient for you. This product contains a 0.25 litre whipped cream dispenser and 48 whipped cream chargers. The dispenser (sometimes referred to as a whipper) is a pressure bottle where the cream and the nitrous oxide can safely combine prior to releasing. The bottle holds one quarter of litre of liquid and after it has been primed with the cream charger this will expand upon dispensing to create three-times its original volume – so what you will end up with is ¾ of a litre of gloriously whipped cream. The small dispenser is available in a selection of colours (all the same price) and is small enough to slip into your luggage for naughty weekend of whipping! It is also suitable for picnic hampers or any other uses when mobile cream is required. These disposable 8gm nitrous oxide chargers are the standard fitting for almost all make of whipped cream dispenser. The gas contained within the refills is certified as food safe and 100% pure. Unlike some budget brands of nitrous refills, these do not contain any residues and are totally flavourless. Each canister contains 2L of gas and is capable of producing 1.5L of whipped cream. When you receive your starter pack the only other thing you will need in order to make whipped cream is the cream itself. The cream can be either “whipping” or “double” but low-fat varities will not work because they do not contain sufficient butterfat to hold the gas bubbles. If it is the first time you are using you equipment then rinse it out with warm soapy water, and then with cold clean water.